Where do folk songs come from? “No one knows, that’s why they’re folk songs.” Yes, I know. However, we cultural spelunkers like the opportunity to clamber deep inside the history of a song or melody and attempt to trace it back as far as we can. Hey ho! First things first, though. 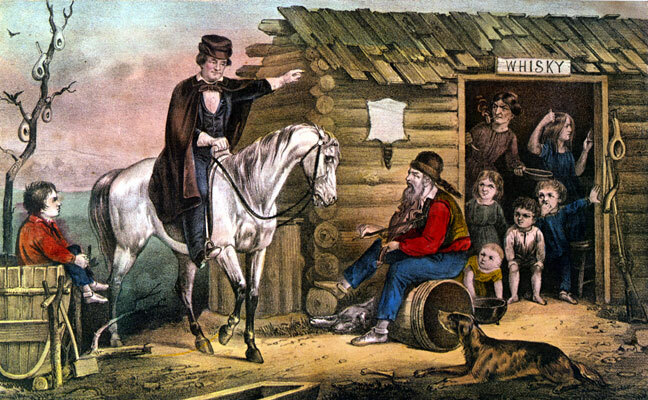 These are considered to be the first recorded country songs (they would be classified as “hillbilly songs” for some time; country music was niche music until the singing cowboys of screen and radio brought into the popular culture), and Alexander Campbell “Eck” Robertson (1887-1975) couldn’t have been picked more deliberately to represent the development of traditional music. He was born and grew up on a farm in the Texas panhandle, on the flat, treeless plains of Llano Estacado. His grandfather was a competitive fiddler, as were his father and uncles. By the time Eck was 16, he was making a living as a musician. Eck traveled with medicine shows, performed in silent movie theaters, played at fiddling contests. He worked up a routine of patter and jokes, and fancy tricks, even coaxing speech sounds out of the instrument with the aid of a metal contact. 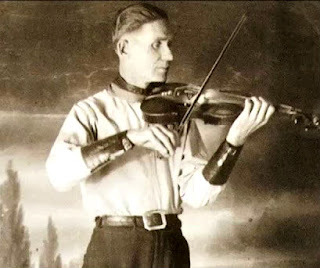 He and fellow fiddler and Civil War vet Henry C. Gilliland went to New York, auditioned for the Victor Talking Machine Company, and recorded a few tunes. Robertson would record sporadically after that, but it wasn’t until he was rediscovered during the urban folk boom of the early 1960s that he was finally given some of the recognition and honor he deserved. Robertson’s virtuosic technique is evident on both recordings; in “Arkansas Traveler” he plays the high harmony to Gilliland’s melody, and in “Sally Gooden,” he whips off the melody and a dozen variations with seeming effortlessness and inventiveness, crashing along at a headstrong pace, underlining all with a compelling, droning ground note. This is dance music, social music, but there is a sense of pride and professionalism as well. Robertson and Gilliland weren’t happened upon in the fields by a Lomax. Music was their business, and in this way music that could almost be defined as tribal moved out into the light and started mutating in response to commercial pressures, technological considerations, and popular taste. Unlike many American folk tunes, “The Arkansas Traveler” comes with some documentation. It came to life as a result of a real-life encounter (or least the embellished superstructure of one). Col. Sanford C. “Sandy” Faulkner (1803-1874) was a prominent cotton planter in Chicot County, Arkansas. In the 1840, he campaigned with some friendly politicians, canvassing the hinterlands of the districts for votes. The party of five men got lost in the backwoods of the Boston Mountains, located on the Ozark Plateau in the northwest portion of the state. They came upon the cabin of a squatter, and Faulkner was nominated to ask directions. The exchange, accompanied by a two-part melody, became a favorite story that Faulkner performed at dinners and functions, until it jumped and spread by word of mouth. Eventually, it was written down; the complete original text can be read here at Historic Arkansas. The gist of the story that the traveler is thwarted time and time again in his attempts to find out where he is, how he can get where he needs to go, whether he and his friends can find food and shelter, or even to establish some kind of communication. Finally the traveler says, “Why don’t you play the rest of that tune?” Squatter says, “I don’t know it.” The traveler takes the fiddle and completes the song with a flourish . . . and suddenly the squatter knows how to get to Little Rock, and has room for the strangers, and plenty of food, and a bit of whiskey as well. The story is solid and well-crafted, punctuated with a string of jokes funny in themselves before the big payoff, musically and comedically. The conflict between the “civilized” person and the simple-acting-but-sly country bumpkin is ancient and easily understood. In 1858, Edward Washburn created a painting depicting the story; it became popular by virtue of being reproduced as an inexpensive Currier & Ives lithograph. It became a vaudeville sketch in 1869, and played on national stages for 20 years. Charles Ives incorporated the tune into his Country Band March (1905), skewering it in the process. Since then, the song has been covered countless times, most notably by Pete Seeger on Frontier Ballads (1954) and Jerry Garcia and David Grisman on Not for Kids Only (1993). “Sallie Gooden” has a more ambiguous origin story. It can be searched for under a number of variant names — Sally, Sallie, Goodin, Gooden, Goodwin, Godwin. The tune is a simple reel, the kind played at dances or “play-parties,” the latter being social events for teens in pre-technology days. The titular heroine is the object of both affection and teasing — “Had a piece of pie, had a piece of puddin’/Gave ‘em both away just to see Sally Goodin”; “Sally is my darlin’, Sally is my daisy/When she says she hates me, I think I’m going crazy”, and on and on, with hundreds of improvised couplets that can be tacked on as long as breath lasts. It is said that the original Sally Goodin ran a beloved boarding house on the Big Sandy River in Kentucky during the Civil War, and was commemorated by Confederate soldiers stationed there. Under the words is the melody, which swings brightly and merrily in a major mode, a simple seesaw that’s easy to learn and build on. Peel back further and you’ll find a darker, quieter source for the song. Before “Sallie Gooden” had lyrics, it was known as “Boatin’ Up Sandy,” when the river was the quickest and easiest path to take north to Ohio, and bore the bulk of commercial trade in the region. “Sandy” is housed in the minor key, a shambling and melancholy piece that aches with loneliness. Leave it to humankind’s natural inclination to leaven such sentiments with humor and energy, transforming a haunting tune into something more upbeat and memorable.